Love the sink!! Only 4 stars because we have not installed it yet!! The Bohr nickel bath sink is designed to be an innovative and luxurious above counter vessel sink. 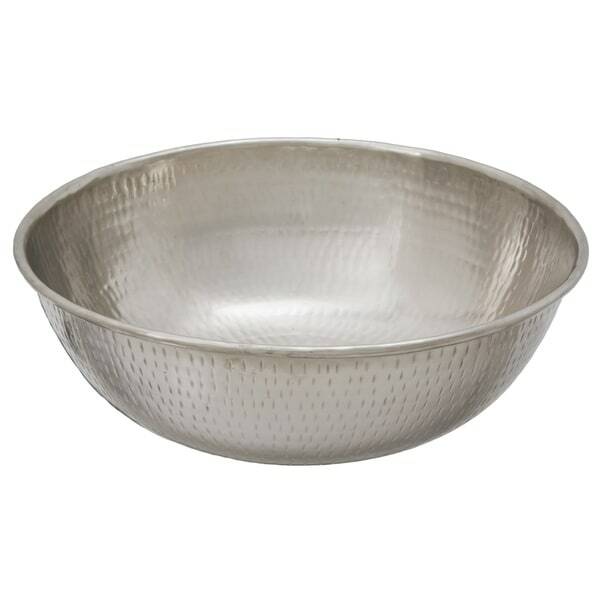 This individually handcrafted sink is made with hammered nickel, making this vessel sink durable and easy to clean. The bold and innovative design offers more than just a sink, it is a work of art for your home. Featuring a maintenance free finish and straightforward installation, a hammered nickel sink from Sinkology is intended for everyday living and offers a limited lifetime warranty. Outer Dimensions: 14" x 14" x 5"
Inner Dimensions: 13.75" x 13.75" x 4.75"
Dimensions 21.0 In. X 19.0 In. X 9.0 In. I just got this installed on an antique little walnut dresser. I use it as a vessel sink and it looks fantastic. I used corrugated tin wainscoting in this small bath with brick tile flooring. Looks impressive. Boy, did i make the right choice. 1900 farm house. Amazingly beautiful. No flaws. We are very happy with our hammered nickel vessel sink and have received numerous compliments on its design. This was a real surprise. I was not expecting much, but it is a charming addition to a guest bathroom remodel. We repurposed a well-made, vintage cabinet for the vanity and installed this with a brushed nickel faucet set (from Overstock), used subway tiles for the counter top and surround. I was worried the sink would water spot from the minerals in our water supply, so put a coating of car wax inside and voila--no water spots, and it practically cleans itself. It has lovely finish and sheen. Would buy again. 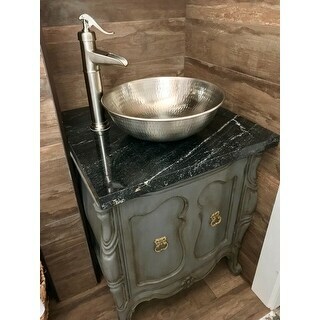 I love this hammered sink it's really beautiful. We used it in our powder room with a bamboo facet, really makes a statement. This sink is SO much nicer than I expected. It is substantial and the finish is exquisite. I love it. The sink is sturdy and gorgeous. While I wasn't sure from the picture about the indents, it looks fantastic in person. if you're looking for this type of sink, just get it. You'll love it. Love! We installed this in our powder room. It sits on a reclaimed wood slab and we added a chrome faucet to it. the water falls nicely into the bowl and doesn't splatter. We used an 8" faucet. Also, our house has pretty hard water, and it doesn't leave water spots. Great sink for the price. Looks very classy. This sink was quick to be delivered and was packaged very well. Can't wait to put in our new bathroom. Purchased for my son for his bathroom in his house that he was renovating. Looks great. He loves it! "The sink looks more silver in color in most of the pictures, but in one of the pictures it looks goldish, especially compared to the faucet. I don't want a "goldish" sink, I need a true brushed nickle. How does everyone's look in person?" "Does this item come with the pop up drain? " The sink comes with an under mount washer but the drain is sold separately. "What inch pop-up drain goes with this...size drain...?" The Sinkology P15-N fits this sink perfectly, but any 1.5 inch drain will work.